Loving Chiropractic of Stuart team members are delighted to announce that Dr. Brian Moriarty, DC has joined the team! 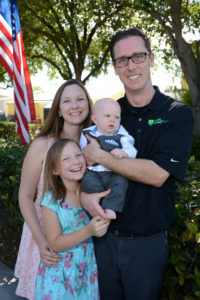 Loving Chiropractic of Stuart has been serving families of Martin and St. Lucie Counties since 2002, and Brian Moriarty, DC intends to help continue the tradition. He provides chiropractic care for individuals and families including infants. Dr. Brian Moriarty is dedicated to helping people live a more fulfilling life without pain and disease. His passion is to help people especially children virtually never be sick. Dr. Brian Moriarty, D.C. is originally from New Jersey. He has been in practice in Orlando since 2006. He has worked on over 200 professional athletes and traveled the world doing so, including going to 2 of tennis majors last year, the French Open and U.S. Open. He has worked on professional athletes in baseball, football, tennis, and golf, including several Hall of Famers and Olympians. He loves working with kids of all ages, and can help young athletes get on the road to success! As a concerned parent, you always want to know how healthy your child is. Many factors contribute to your child’s overall health. A major component to your child’s health is the communication between your child’s brain and body, called the nervous system. This vital link controls the growth, repair, and function of every cell, tissue and organ in the body. Proper diet, exercise, rest, and emotional and spiritual support factor into this as well. Chiropractic recognizes the importance of each of these factors as they contribute to your child’s health. Chiropractors look for areas in the spine that are misaligned (subluxated) and adjust the spine to restore the nervous system back to its optimum potential. By removing the obstruction, this helps the body to heal itself. At Loving Chiropractic of Stuart, we know that the children who are under regular chiropractic care benefit immensely and their bodies are functioning at their best. Childhood conditions such as earaches, ear infections, bed wetting, and tonsil and adenoid problems often respond very favorably to chiropractic spinal adjustments. Allergies, frequent nose bleeds, hyperactivity, skin rashes, asthma, stomach troubles, scoliosis, heart arrhythmias, constipation, all can be helped with chiropractic care. We invite you to call us at 772-219-3313. We accept most insurances including Medicare and have very affordable individual and family care plans. Dr. Brian Moriarty, DC has a B.S. from Oglethorpe University and a D.C. from Palmer College of Chiropractic Florida. Loving Chiorpractic of Stuart is located at 630 SE Monterey Road, Stuart, FL. Phone: 772-219-3313.